I felt like I should do something for this Thanksgiving, but, to be honest, I have already pretty much exhausted my Thanksgiving movie options after Planes, Trains and Automobiles and, to an extent, Miracle on 34th Street (unless I wanted to review the remake, too…). 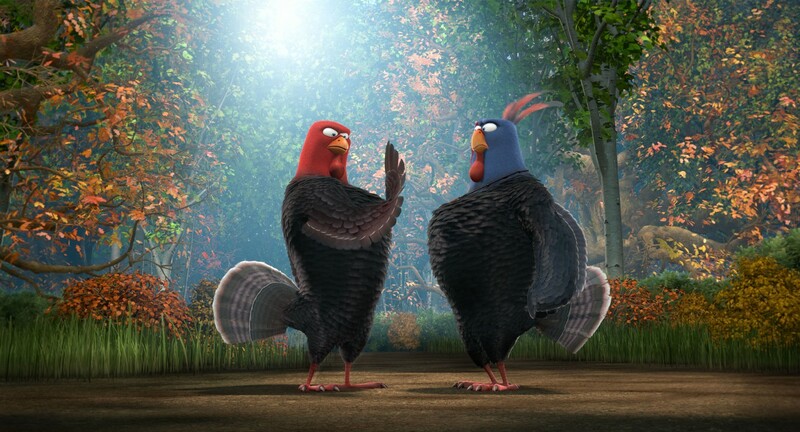 Luckily, last year brought us a brand new Thanksgiving film to watch just before Turkey Day: Free Birds, a film that will have you shouting at the person who announces they’re about to put it on, “Play ‘Free Bird’!” because you’ll undoubtedly rather hear a great but very long Lynyrd Skynyrd song than see the movie that apparently didn’t even have the sense to license the song for the obvious reference I just made. (It instead plays a cover of CCR’s “Up Around the Bend” as played by Social Distortion over the credits. I guess it is a much more upbeat song, but I’m not too certain lyrical context really matters to a movie like this.) When I told people what I was reviewing out of desperation for another film, they strongly advised that I instead review the Charlie Brown TV special, which… yeah, that probably would’ve been more tolerable, but I felt like I should at least exhaust all theatrical film options, and at least this film was on Netflix streaming, so I wouldn’t have to take up a slot in my DVD queue, either. So, yeah, I watched Free Birds. … Here’s the review. Reggie is a turkey who lives on a turkey farm. He’s not like other turkeys however, because he’s actually smart and recognizes that the other turkeys are pretty big idiots. Naturally, they all hate him and don’t believe his crackpot theories about what the farmers are really up to: eating them. Reggie is saved from certain doom, however, when the President of the United States comes to pardon one of them and, thanks to Reggie’s pariah status, he is singled out for salvation by what appears to be a younger, alternate reality version of Bill Clinton who has apparently been divorced, since there’s a kooky little girl but no mother in sight. Reggie enjoys his new existence at Camp David, where he is afforded all the TV and delivery pizza he wants. A life of luxury doesn’t come easy, however, when Jake, a bumbling meathead of a turkey, steals Reggie away and takes him on a mission back in time, where they team up with a tribe of Native American turkeys to stop the first Thanksgiving from happening and save all of turkey kind from hundreds of years of annual, delicious slaughter. 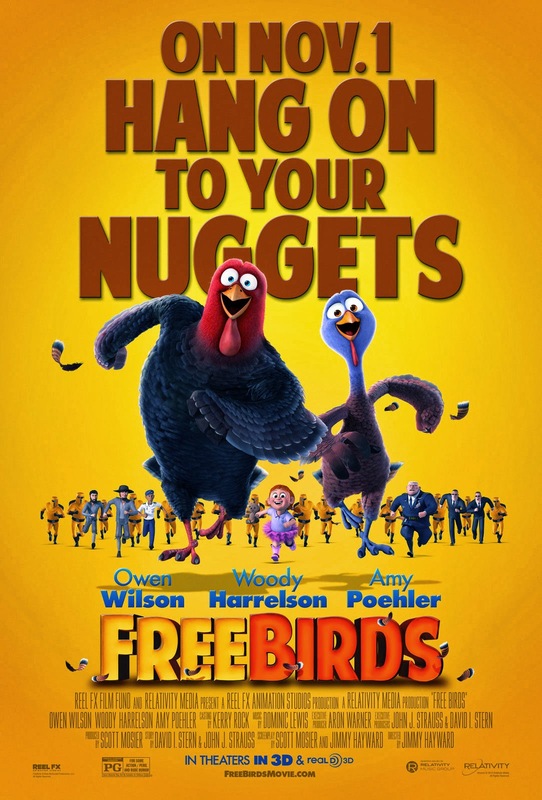 Free Birds is another one of those child and family-aimed movies that is released by a small studio that seems to fall into that trap of aping DreamWorks Animation films by making as many cultural references as it can in the name of getting a chuckle out of its audience because, hey, that’s a personality quirk I can recognize as being something that humans sometimes do that turkey’s typically don’t. Naturally, this leads to such irreverent situations as when a diminutive 17th century sidekick character with a Mexican accent will request a high five and then say, “Don’t leave me hangin’,” while the more serious types stare back pensively at him, contemplating the ways in which they can harm the lovably annoying little twit. In another gag, the two meatheads from different time frames become rivals, and their fighting at one point turns into an elaborate and possibly affectionate swing dance number before they even realize how awkward the situation has become, possibly because they’ve fallen in love or something. It’s funny because… random? Luckily, to the film’s credit, it’s not just a series of ridiculous “gags.” The film attempts to build up some plot and motivations for the characters. The big buffoon Jake’s backstory is an attempt to lend the film some Pixar-level pathos and is, I guess, the most exciting and interesting part of the movie, despite the very silly quasi-religious angle they give it. Reggie, our lead, really couldn’t give a crap about his mission, at first, until he falls in love with the chief’s daughter and leader of the resistance… Jenny (Really? I guess they thought it would be racist if they gave her a Native name or something?). Naturally, she is his catalyst for realizing the importance of the opportunity he’s been given, and so we get to see him at least grow into his heroic role. Too bad he’s the most bland character in the film. Seriously, the time machine, as voiced by George Takei doing his usual schtick, is more entertaining. 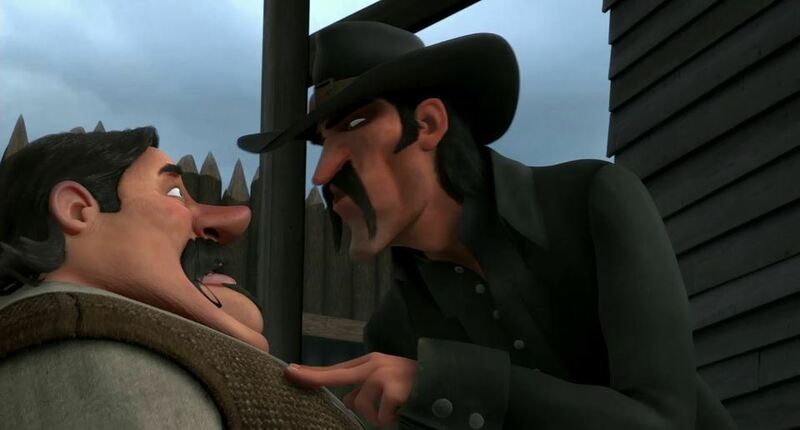 The villain of the film is Myles Standish, who is portrayed in the film as a paranoid, generic mustachioed villain in dark clothing and a deep, raspy voice, an apparent fear of … short pants, for some reason… and a desperate need to slaughter every turkey in the vicinity of the Pilgrims’ colony. This sounds awful until you consider the fact that the Pilgrims are shown to be desperate and starving to death – we even see one die on screen to our comedic delight, right after the comic reveal of the grave sights nearby, no doubt some belonging to children. Sure, I probably shouldn’t take that too seriously, as we’ve been asked to see things from the humorous animals’ perspective countless times in Looney Tunes shorts, but when you’re dealing with a feature length film that actually acknowledges the seriousness of their suffering and then offers as the only solution a ridiculous plot contrivance that also serves as a means of product placement (Chuck E. Cheese, anyone? ), it’s hard not to empathize. 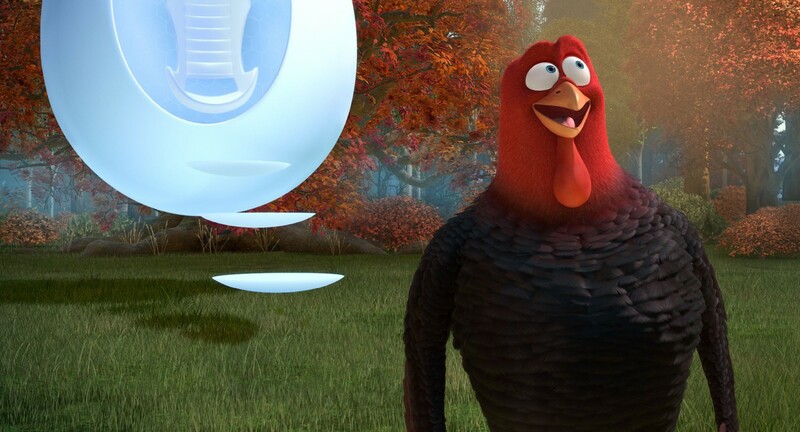 Plus, the attempts to give the turkeys their more dramatic moments are so generic and hamfisted, you can’t help but let your mind drift to places other than where the movie wants to take you. This isn’t a particularly smart or well made film, if you can’t tell. (Its poster can’t even make a decent pun — you make nuggets out of chickens, guys.) 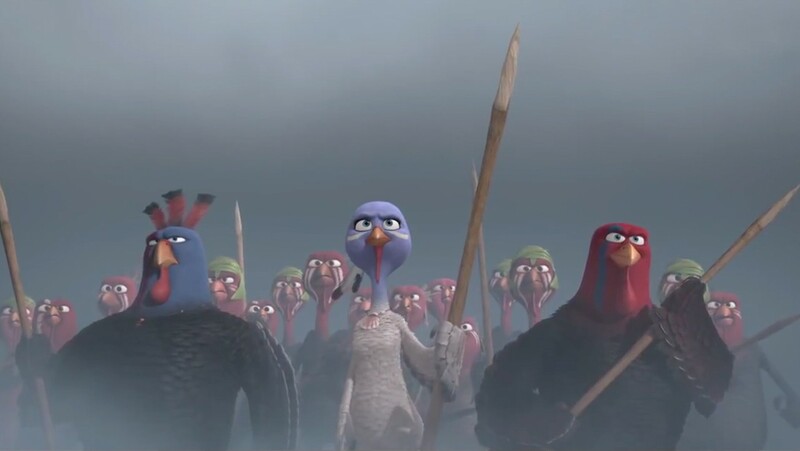 It’s also not funny, and the animation is merely serviceable, with pretty much only a few models made for the turkey characters that are then noticeably given different textures and ornaments, which is still not enough to make the turkey society feel less like a colony of clones. As for the story, the whole conflict can be resolved through much more efficient and logical means than the one that Reggie ultimately chooses. While all time travel movies have their inherent logical flaws, most of them at least have the good sense to put some rules and limitations on the means through which the characters manipulate time in order to maintain the film’s central conflict. The means of powering the time machine in Back to the Future, for example, required Marty to repair the timeline within a certain time frame and ensure that the time machine was in the exact right spot at exactly the right time and at exactly the right speed so that he can continue to exist and go back to his own time. Free Birds provides no such plot device, as the time machine recharges on its own after a while, allowing Reggie to go back and forth pretty much whenever he wants. So when – oh yeah, spoilers follow, by the way – so when Jake, after getting over his funk, decides to use the machine to influence a young Jake into becoming a hero and then take him back in time in the first place, he must also then get back in time before it’s too late and stop the battle that’s about to take place between the “angry birds” (one of the many hilarious pop culture references they make in the film) and Pilgrims. Yes, you heard that right. The climax requires that Reggie get back in time… in a time machine… before it’s too late. Never mind that he could, you know, solve everything, including the one dramatic character death we’re treated to, by just going back and preventing it all from ever happening. Little kids may never actually think about these kinds of things when they’re watching it before the age of, say, 12 or maybe even 10, but that just means that they’ll then grow up to resent the film that they liked as a child, so why would you subject them to a film that they might actually grow to like only for them to grow gradually more resentful once they come of age and realize this movie is just horribly bland crap? It’s not as if the humor saves the movie, and even the performances are immensely stale, save for Amy Poehler and Woody Harrelson, who seem to be giving it their all, but I think that has more to do with Amy Poehler reportedly being an immensely nice person and Woody Harrelson being a pretty well-known vegan. Owen Wilson, on the other hand, seems to be drifting through his role as Reggie, coming off as more bored compared to his usual laidback characters. I’d have preferred that they had gone with someone far more neurotic sounding for the role, like Jesse Eisenberg, but I guess he’s caught up playing yet another bird struggling to survive in that other animated film about wacky pop culture-referencing birds, so they went with the guy who voiced that talking car in the other dull animated film series. 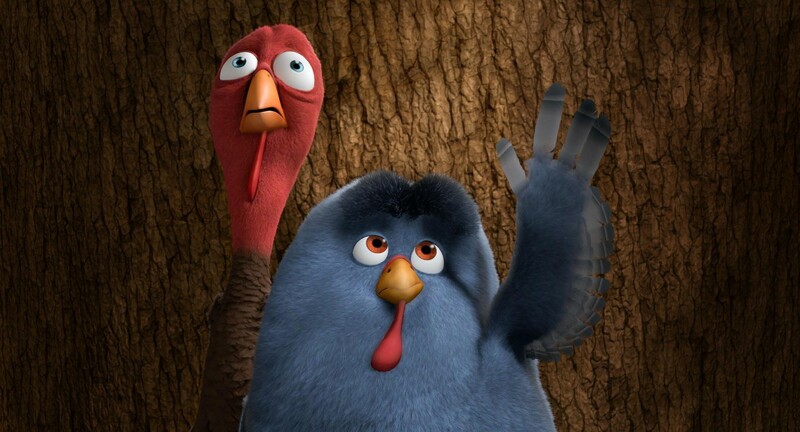 Free Birds may be one of the few Thanksgiving films out there, but if you haven’t already seen it, trust me when I say that it will put you to sleep faster than any food coma or a massive dose of tryptophan ever could – seriously, I had to restart this movie three times to get the full picture. There are so many better ways to spend your Thanksgiving day than with this horrible excuse for an animated feature film. Watch Planes, Trains and Automobiles and teach your children about the artful use of the F-word. Put on some football or the Macy’s Thanksgiving Day Parade and ignore it in the background while stuffing your face with deviled eggs. Get a head start on Christmas and by watching the remake of Miracle on 34th Street and tell everyone with a straight face that it’s superior to the original film and watch their reactions when you tell them it’s because it’s in color. Or maybe go Black “Friday” shopping and gawk at the miserable people who have to serve you and thousands of others when they would rather see their families on Thanksgiving. Any of that would be more worthwhile than spending the 91 minutes it takes to watch Free Birds from beginning to end.